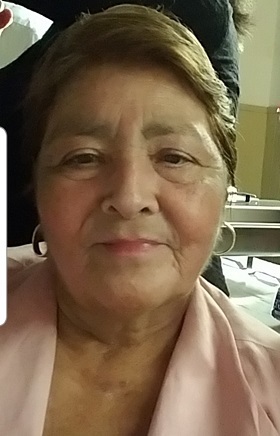 Maria Rosa Elia Castillo, 66, passed away on Monday, April 8, 2019 in San Antonio, Texas. Left to cherish her memory is her husband Fernando Castillo; children, Gina (Ken) Bouble, Rosa Castillo, Yvette Castillo, Virginia (Roger) Rodriguez, Fernanda Castillo, Erika (Lorenzo) Navarro, Fernando (Reyna) Castillo, Nancy (Efigenio) Ortiz, Cristal (Raul) Gomez, and Federico Castillo. She is also survived by 18 grandchildren, and 1 great-grandchild, nieces, nephews, other relatives and friends. A discourse will be held on Friday, April 12, 2019 at 7:00 p.m. at Gamez & Sons Funeral and Cremation Services. Visitation will be held from 5:00 p.m. to 9:00 p.m.
A funeral service will be held on Saturday April 13, 2019 from 7:00 a.m. to 9:30 a.m. Interment will follow to the Calvary Catholic Cemetery.